What in the World Is an Electronic Records Archivist? Home / What in the World Is an Electronic Records Archivist? Think about how much you use your cell phone or computer in a day. You create countless photographs, text messages, emails, Facebook posts, blog posts, tweets—and the list goes on. In the past, these types of daily documentation, such as letters, photographs, journaling, and commentary on daily life, were harder to create, and more permanent. Do you have a plan of what to do with the huge amount of historic data you create every day? Or will it just be lost with time? Are we entering an age where our future generations will not be able to research our current lifestyle, culture, or heritage? Currently, archivists are trying to establish standards, policies, and methods to preserve the massive amount of data the world is rapidly creating. Not only is the amount of data an issue; so is the pace at which technologies are changing. At the North Dakota State Archives, we are working to preserve digital records created by state agencies, organizations, and private donors. 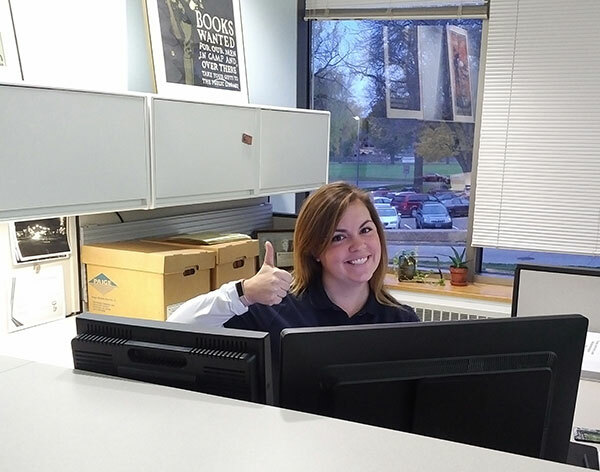 This is me, Lindsay Schott, electronic records archivist for the state of North Dakota! As the first electronic records archivist for the state of North Dakota, I am responsible for ensuring that digital files created by state agencies are preserved and accessible for future generations. I am currently working on creating policies and procedures to establish a digital archives repository. This repository will allow me to track file formats and add descriptive terms to the files. These descriptive terms, will allow researchers to search and access digital records online through a portal in the future. This is a glimpse of just a few varieties of the external media on which state agency electronic records are stored. The State Archives has accepted manuscripts and other types of records since its inception. With the advent of new technology, that includes electronic files. That’s what I work with, the “new” technology, whether it is a file saved on some object from the 1970s or ’80s, or whether it is a current mp3 or pdf file. On any given day, I could find a collection housed in the State Archives that contains 3.5-inch diskettes, 5.25-inch floppy disks, CDs, DVDs, or other types of external storage devices. Or, a state agency can contact me with digital files that have reached their retention period, and we work to transfer these files through a file sharing site. These collections contain the digital photographs, documents, videos, audio files, websites, emails, and more created by North Dakota state agencies. As you can imagine, many different file types have been used when creating electronic records. Just think about the all of the different programs and versions of software that have been around since the beginning of computers. For instance, Apple generally updates the iOS on iPhones a few times in one year. Imagine having to track these updates for all types of records! It is my job to ingest these electronic records into a trusted digital repository. Progression of records throughout the history of North Dakota. Left: Record books in storage at the Stark County Courthouse in Dickinson, 1937 (30573-00119, detail). Middle: Box of floppy disks waiting to be ingested into the digital repository. These were created in the early 1990s. Right: A screenshot of digital records in the digital repository. Now, instead of taking up shelf space, records take up lots of server space! Click image for larger view. Keeping up with technology is just one of the many obstacles that electronic records archivists face. Format and media obsolescence are two very large hurdles standing in the way of digital record preservation. As the technologies change, file formats, storage media, software, and hardware go out of style and use. Electronic record archivists must make sure that these obsolescent file formats are migrated to a file format that is better suited for preservation. That is one of the reasons why we have many older computers around the State Archives. In order to ensure we can get the files off old storage devices, we need to have these older computers, because they can read older storage media. For example, computers sold today don’t have a 5.25-inch floppy drive. So, we have maintained several computer towers from the time when these floppy drives were a necessity. In the future, we may have to keep several towers that have USB ports to make certain we have the capability to read USB drives. 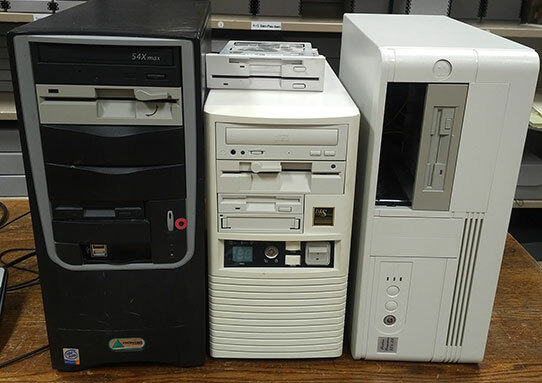 These are a few of the old computers we have at the State Archives to ensure we are able to access old external media. It is crucial that electronic records archivists take action immediately. If we don’t, the information found in the files may not remain available due to the rapid, changing pace of technology.